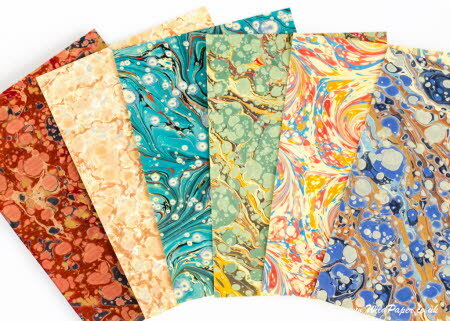 The Veined Marbled 'stone-look' paper swatch pack contains 6 mini sheets 12.5 cm by 8.7 cm (4¾" by 3½") of hand marbled paper produced by marbled paper artist Laura Berretti in Florence, Italy. Each is labelled with the name of the paper on the reverse so that you can check the colour, paper texture and print appearance before you buy larger sheets of these papers. The pack includes these sheets: Blue & Gold Veined marble, Burgundy & Gold Veined marble, Cream & Silver Veined marble, Cream & Blue French Curl, Green & Gold Veined marble and Turquoise Sun Spot. These are traditionally marbled paper using combs, stylus or rakes in classical patterns that include peacock-tailed feather patterns, stone marble and veined marble patterns, French curls, sun spot and dragon skin patterns.